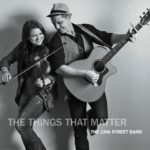 The 19th Street Band, The Things That Matter. Album Review. We all understand The Things That Matter and yet as 21st Century beings we find ourselves continually cut adrift from them, we have cut so many ties to family, to friends, to the past and to nature, we have chased the Dollar, the Pound and the Euro, we have greedily sought to own more, abuse our bodies, as well as our surroundings, we have lost sight of The Things That Matter, so much so that it could be remarked that we have become shadows on a mural; inconsequential, pretty to look at but faded by remorse and Time. For The 19th Street Band, the things that matter, education of those around you, of love, of forgiveness, of holding on to the real and not the imagined and the trivial, these are the powers that bind, and in each of the six songs that make up The Things That Matter and partly infused by husband and wife team Caolaidhe and Meghan Davies show, love is very much part of the establishment feel; it is the only belief that truly is seen across the political spectrum as being both divisive and honour bound. Meghan Davies’ fiddle is both exhilarating and defiant as Brian White’s bass, Patty Dougherty’s drums, Tom Verratti’s banjo and Caolaidhe Davies’ various guitars and vocals are staunch and progressive; it is a wonderful combination of the two effects that make the songs as fascinating and attention grabbing as they do. There is always a sense of responsibility to the music that comes from any artist; if there is no passion; one has to remind them what are the points of existence and pursuit? The 19th Street Band hold to that passion perfectly, the fiddle could be seen as the whirling baton of the demonstrative conductor organising the troops on stage, each moment a sentiment, a reminder of the beauty in hand; to make the music so strong it cannot be admonished or charged with neglect. In the songs Long Runs The Fox, Trouble and the title track The Things That Matter The 19th Street Band show why they matter, why they are the stuff of substance and polish, it goes without saying they are the cornerstone of their neighbourhood and beyond.